We check Our prices all day every day to bring you the cheapest holidays. We choose this opportunity to thank holiday tours & travel for your kind attention you paid to us. 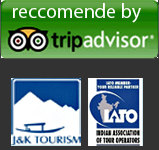 It was marvelous, the car was good ,the driver's services were excellent ,the guides were very helpful. The hotels we had in jaipur & Agra were nice . We were very sad for not having the opportunity to visit Kashmir hope next time . Thanks once again we will share our experience to our friends & relatives.